What should I watch while Downton Abbey is gone? Great shows to remedy your Downton DTs for the next year. Courtesy © Carnival Film & Television Limited 2011 for MASTERPIECE. See our Magnum Photos gallery on the English countryside. Dan Kois, Seth Stevenson, and June Thomas will be chatting with readers about the Downton Abbey finale and all of the highs and lows of the show’s second season. Join them on Facebook at 2 p.m. on Tuesday, Feb. 21 to take part in the chat. Seth, you asked for predictions for Season 3. I see Ireland. I see general strike. I see Bates digging his way out of prison and finding the Viking remains that we now know as York’s Jorvik Centre. 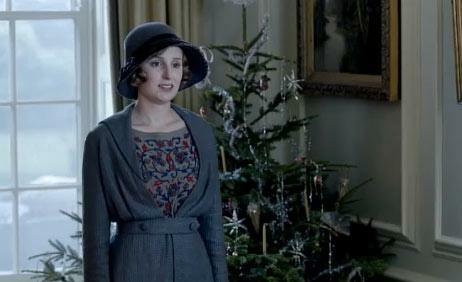 I see Lady Edith becoming a barnstorming aviatrix, but perhaps that’s for Season 4. Once Downton enters the 1920s, I predict a wonderful opportunity for a crossover with another show from the period. Yes, I want to see bootleggers of Boardwalk Empire attend a Downton house party. How will I fill the empty hours until Downton returns? I plan to rewatch the entire run of Upstairs Downstairs, as well as the 1967 version of The Forsyte Saga. (I know the recent remake, starring Homeland’s Damian Lewis, has its partisans, but Nyree Dawn Porter, who played Irene Forsyte back in the 1960s, was my very first crush.) For costume dramas featuring feisty sisters, you can’t do better than The House of Eliott. And here’s a final wild card suggestion: Between 1986 and 1994, Phyllis Logan, known to us Downton heads as Mrs. Hughes, played Lady Jane Felsham, antiques dealer Ian McShane’s aristocratic patron and flirting partner in Lovejoy. I remember it fondly.